It's tough getting out of the house with kids. It's totally doable don't get me wrong but it's the timescales and degree of preparation involved. There's them to get ready and ourselves, but also all of their stuff... when we're a first time Mum we're overwhelmed with all of the paraphernalia that goes in a nappy changing bag, but imagine having that, plus the baby plus a school age child(ren) and a school run to do whatever the weather. At least when you're home alone with a baby on maternity leave you have the option of staying indoors in your PJs with your offspring in nothing more than a sleep suit. Enjoying a babymoon. You don't know it at the time, but life doesn't get much better than that. I have been amazed, flabbergasted in fact, at how different having a second child is to the first. They never get the chance to stay in bed unless it's the weekend, the school holidays or inset days. Oh inset days, they have a certain lusciousness about them don't they? You're off but the rest of the world is not. Almost like when you had a week day off when you worked Monday to Friday. Naughty but nice. Like a cream cake. (I'm showing my age to remember that advert but hey ho)! So there are things us Mums can do to get out of the house more quickly and one of them is the adoption of a Mum Uniform. Gone are the days where we peruse our wardrobe thinking shall I wear pink or peach, Zara or Next. No, now it is more along the lines of "what's clean?" or "is it ironed?" the latter of course not applying to me as I iron NOTHING! But the most important thing is the act of getting dressed. Don't whatever you do, do the school run in your PJs. At our school a Mum dons PJs and a dressing gown and slippers. 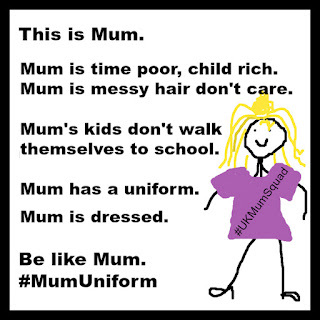 Don't do that #BeLikeMum and adopt a Mum Uniform, it works for #UKMumSquad. So knowing in advance what suits us is half the battle and having a capsule wardrobe means the battle is won! Both for cost reasons and storage reasons (those kids take up a lot of space - I share my wardrobe with mine, literally)! 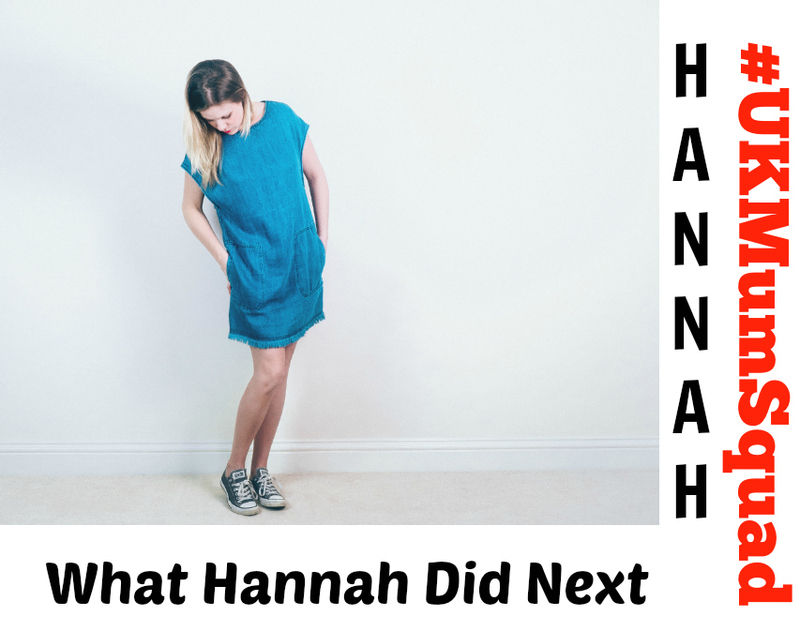 First up, Hannah from What Hannah Did Next. One of the first (and loveliest) bloggers I ever met IRL. Something that's quick and easy to put on, is comfortable but yet still looks like I've made a slight effort with being stylish! Last year I bought a denim pinafore dress and I lived in it throughout the seasons. It was perfect in the summer months with bare legs, a t-shirt/vest underneath and sandals. Yet it was versatile enough for the colder weather teamed with tights and a long sleeve top underneath. Now I've bought another denim dress that's a slouchy style that is going to be my go to outfit. Have you always had one or like me is it just since motherhood? What about it makes you feel confident? When I wear a dress I feel more girly. A bit like when you've done your makeup or painted your nails, it instantly picks me up a little. 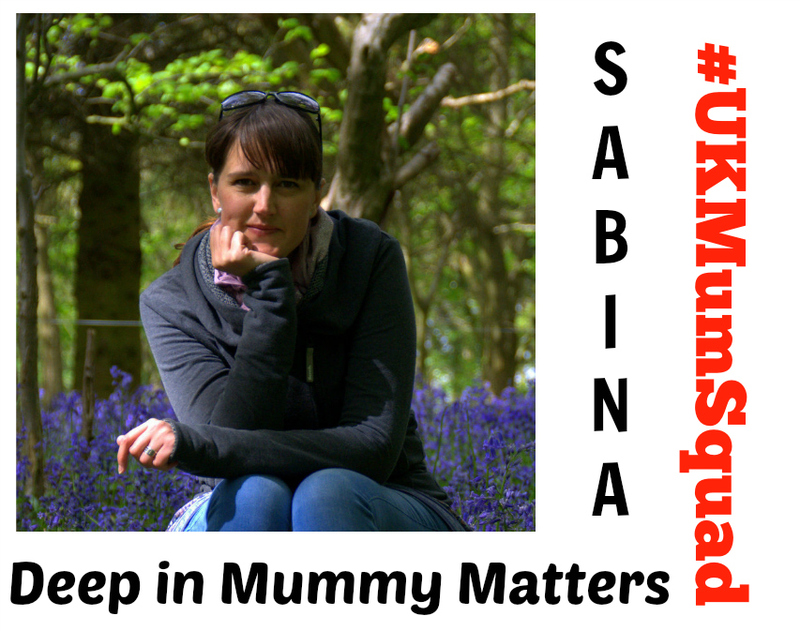 Sabina from Deep in Mummy Matters also told me about hers. I've known Sabina for years and loved having a giggle with her at Thomas Land. What's your mum uniform?My Mum uniform tends to be jeans and a sweatshirt or leggings and a dress through the Autumn/Winter months and maxi dresses or denim shorts and vest tops in the Summer. 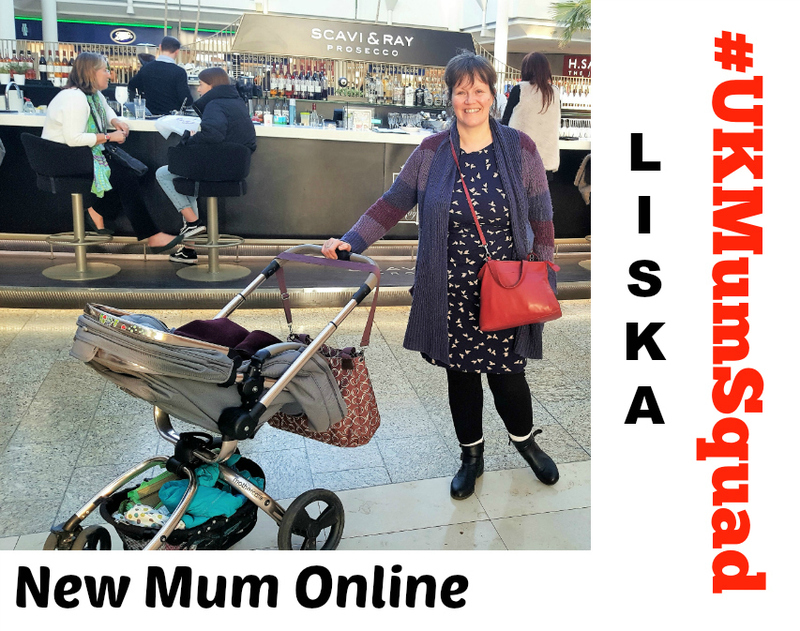 Have you always had one or like me is it just since motherhood?Before I became a Mum I worked in offices so I wore suits, becoming a Mum and have a very 'changed' figure I naturally wear more comfortable clothes. I have friends who say they stopped saving their 'best' clothes for going out as they would never get worn but working from home it just feels a bit overkill to be dressed up. What about it makes you feel confident?The only time I feel confident in my clothes is when I actually dress up for a night out, the rest of the time I feel pretty rubbish about my general look. 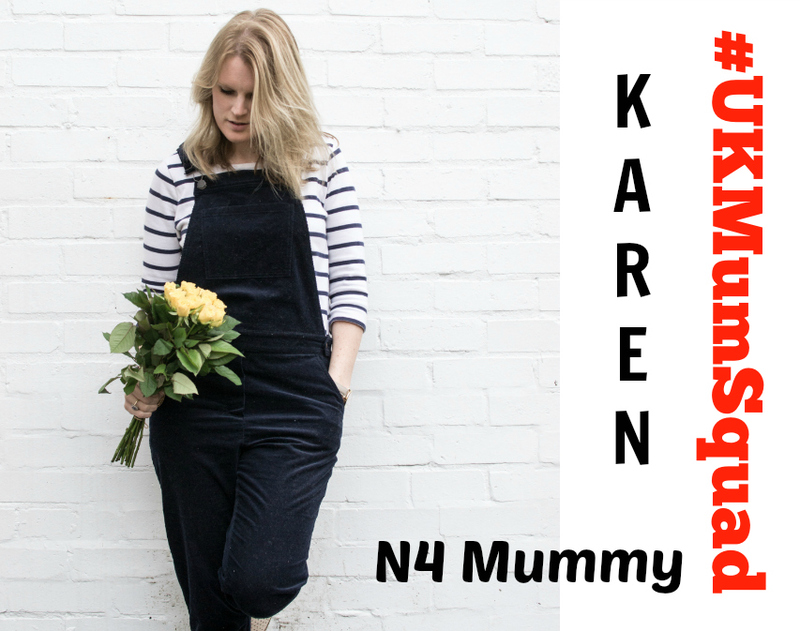 N4 Mummy's Karen is a cool kitten indeed having been featured on Selfish Mother and Toms all in one week. In fact 7 of our gang of 12 met up at the recent Toms UK event. No just since motherhood as I now have no time to think! Red lippy always makes me smile! 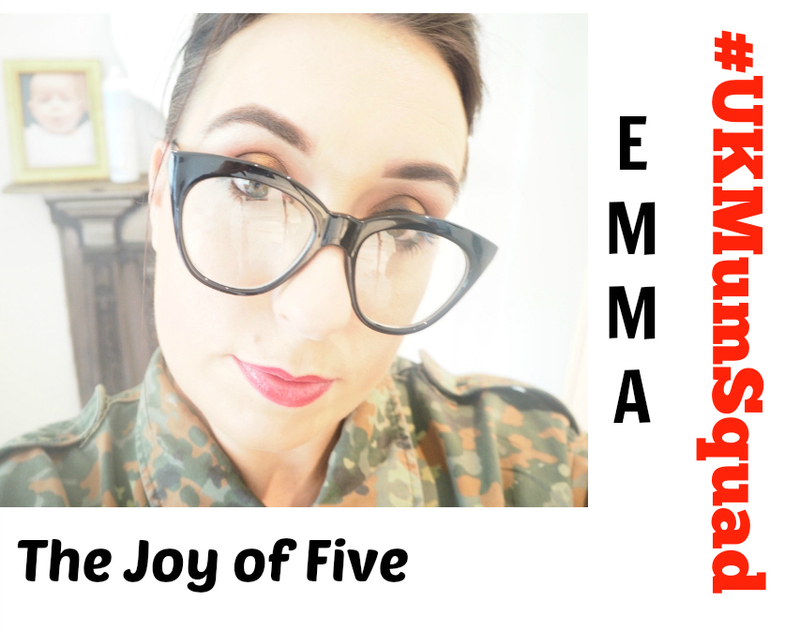 Now our lovely Emma knows the importance of a Mum Uniform as not only is she is a Mum of FIVE blogging at The Joy of Five, but she's also soon to be a nanny. What's your Mum Uniform?I would say my uniform changes with my mood that day. It's all about feeling confident and so if I'm feeling insecure about a certain area then I try to dress to hide what I'm not happy about. Jeans, ankle boots and a baggy top are probably my go to items though. What about it makes you feel confident? I like to try and have something bright in my outfit or makeup as that always gives me a lift and helps me feel more confident. 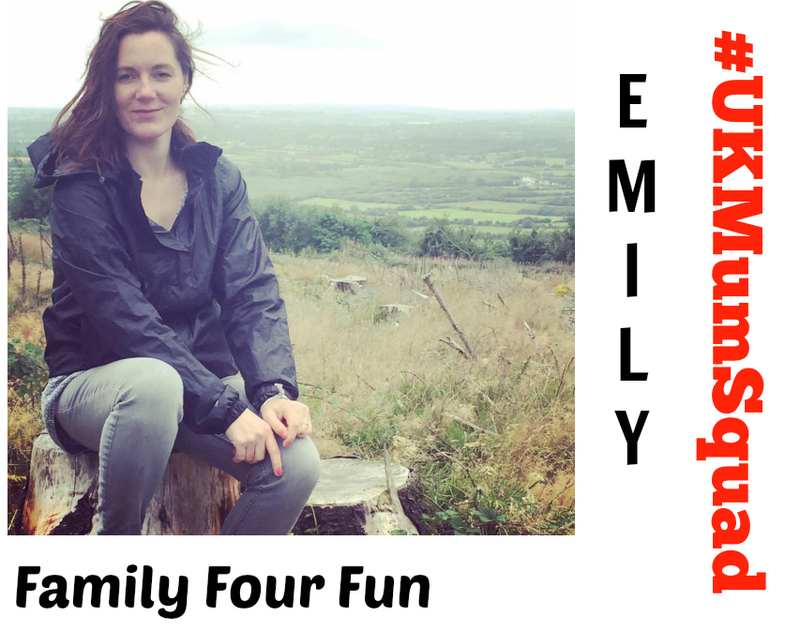 Emily Family Four Fun is someone I have known in the blogging world for years and years. She has a joy filled life with her husband and family of four children meaning she also knows the importance of a Mum Uniform. Didn't realise I had one but over the years find myself grabbing for the same comfortable clothes more and more. Those clothes (in Autumn/Winter) are jeans and a t-shirt with a pair of slouchy boots pulled over and my fat face parka thrown over the top. They're warm and comfortable and I trust them to look ok whilst forming a trustworthy barrier against the elements. So it has to be flattering. It has to be non iron. I've discovered I even love things that can't be tumble dried as I just hang them, air dry them and they're crease free and good to go. Even better when they're to hand when I need them. My Mum Uniform has become a dress with leggings underneath and that's NOT because it's Winter it is because my legs are HAIRY :-) I got a Merino wool Hobbs dress from my Mother in Law and Sister in Law for Christmas and as it was the 2nd or 3rd year in a row they'd got me a dress I got to thinking about it and it dawned on me how often I wear them so I bought a couple more. The budget did not allow for this so they were charity shop bargains like the Phase Eight dress you see pictured above. I now feel great even on the school run. My Mum Uniform has only really been a thing since 2017, since Christmas. When the penny dropped. When Aaron was in Reception and Year 1 I would do that thing of trying to put an outfit together each morning, when time just didn't allow. No wonder we were so often late for school 2014 and 2015. Now we never ever are. 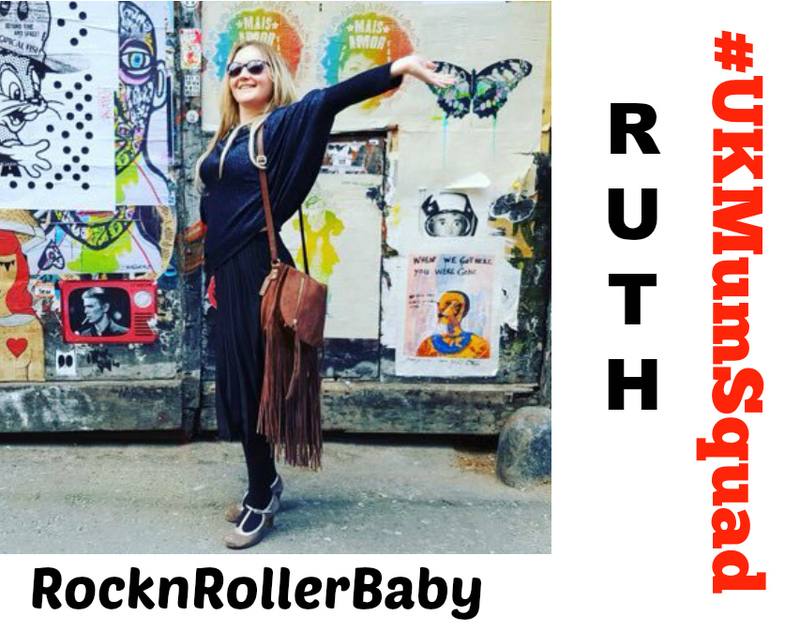 Our wonderful Ruth, one of the Gurus of our squad, blogging very regularly at RocknRollerBaby. Judging by her pic she's competing with Karen in the rock chick stakes but with hubby in a band and her URL that's no surprise girlfriend! My Mum uniform is black tights and boots in the colder months and when the sun comes out I prefer floral and floaty. I like to mix things up with pieces which are maybe vintage or a little bit different, I do like to try and make a statement. However, for those days when you just want to feel comfortable it's very easy to throw on a baggy jumper dress to conceal a mum tum and team it with shades to hide the eye bags - I guess on days when I feel a touch self conscious it's all about the hiding factor... That's not to say I don't know HOW to get my groove on and I absolutely will add a statement piece be it in my coat, make-up or jewellery just to show I'm still me. I'd say that before and after having babies my most worn colour is black and I have so many baggy batwing jumpers from Tezenis that even my daughter calls them my uniform... Might have to rectify that! In the picture I'm wearing a pleated black skirt from Asos, A Sparkly bat wing jumper from Tezenis, T-Bar dancing shoes from Clarks and my bag is Asos too. 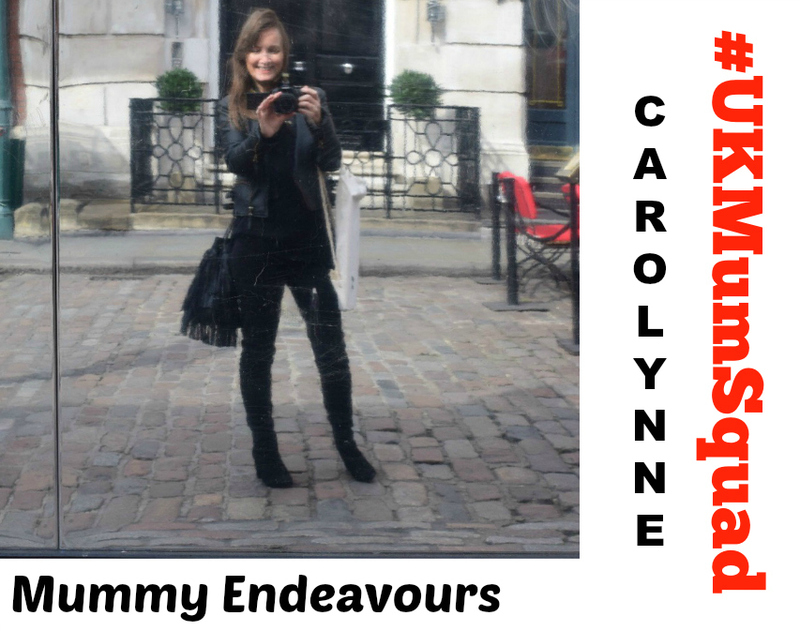 Mummy Endeavours' Carolynne is a go get 'em blogger. Whenever I am stalking the hashtag for an event, she's there, shaking her funky blogging stuff. My mum uniform has changed now that I work three days a week because obviously I have to make more of an effort on those days :) But if I'm not working I love to just throw on something comfortable. I'm a lazy morning person and always in a rush so usually it's jeans, boots and a jumper in the winter and jeans with flip flops in the summer! I quite often change for the afternoon school run when I've had more time to consider my outfit, Oh and I'll do my hair and makeup! Have you always had one or is it just since motherhood? Definitely since motherhood! My eldest is 18 and I have to admit to not owning a pair of flat shoes before I embarked on the school run. I'm not even joking... even my sandals were high wedges! Flat shoes and flat boots are my go to now for the school run.... comfort is key! Uggs are my all time favourite! I love my mum uniform of jeans but will wear heels with them when I want to feel more confident! So tell me what is your Mum Uniform? And remember, #BeLikeMum and get dressed. Always, when leaving the house, get dressed LOL. 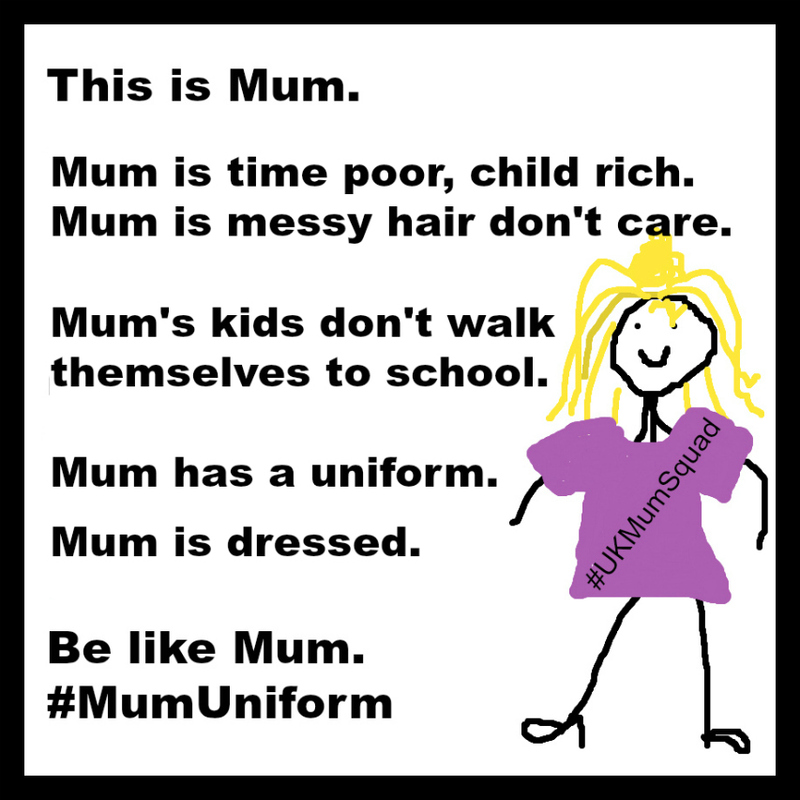 I hope to update this post to let you know what the rest of #UKMumSquad wear as THEIR Mum Uniform. Ruth from RocknRollerBaby has already blogged about #UKMumSquad's recent outing to the Toms UK event, but alas I was at home nursing a very sick Lottie.